Randy Rothfus has the perfect gag gift for novelty seekers. 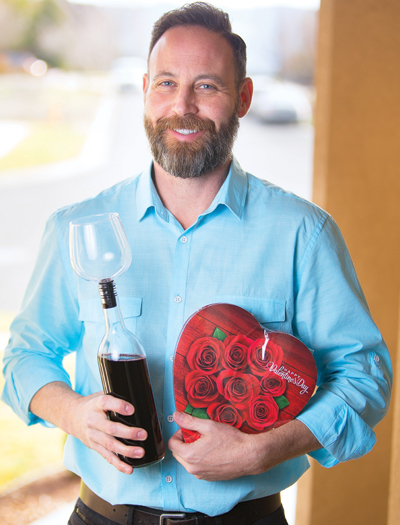 The retired dentist, children’s book author, and entrepreneur came up with an invention for those who think “pouring is boring.” His Guzzle Buddy—a glass that attaches to the top of almost any wine or beer bottle—became an instant viral hit, as well as a Shark Tank contender, thanks to one well-timed Twitter post. During the 2016 presidential debate season, Rothfus shared a picture of a Guzzle Buddy wine glass and wrote: “We all need this to get us through the next debate.” Suddenly, he and his business partner—sister-in-law Jennifer Brick-Sullivan—became an overnight success. “I was at a concert, and my phone, which alerted me to sales, just started pinging,” Rothfus says. “It pinged eight times in one minute.” The pings just kept coming, and their Guzzle Buddy sold out in three days—to buyers from every continent except Antarctica. “It went crazy,” Rothfus says. So crazy, in fact, that the Guzzle Buddy appeared in Cosmopolitan and on a number of television shows—including Ellen, Live With Kelly, and 8 Out of 10 Cats, a British show that featured it during an episode with actress Carrie Fisher—before landing on Shark Tank. It was on this reality show, where aspiring entrepreneurs vie to hook an investor, that Rothfus and Sullivan may have hit it big. Their January 2018 episode helped them strike a potential $400,000 deal with Daymond John, an entrepreneur and Shark Tank judge who spoke on the UI campus in 2015. John agreed to invest in Guzzle Buddy for a 25 percent share of the company. Though Rothfus says they’re still in negotiations with John, the Guzzle Buddy franchise continues to grow. They recently debuted a Guzzle Buddy in unbreakable plastic and have plans to introduce a kid-friendly Float Buddy for soda floats.